So there's a new coffee shop in town, and boy does it look similar to my local favorite, Starbucks. Gotta love trademark infringement within China. Barkstars unlike Starbucks is "dog friendly." Starbucks in Beijing is pretty close to the US, except for some of the crazy drinks they also offer like stuff with red bean and I bet we have WAY more green tea drinks than the US. What surprised me when I got back was that the drink prices are almost exactly the same. Beijing is more expensive by $0.50 at the most for most drinks. I'm not sure about the food stuffs. 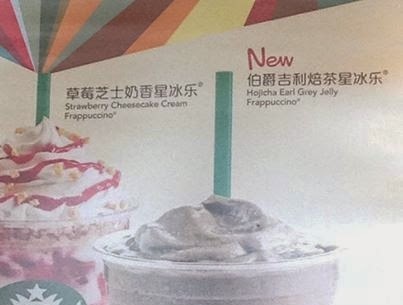 A friend in Shanghai posted a promotional poster that had some more interesting flavors, sadly I haven't seen these offered in Beijing. The strawberry cheesecake frap sounds good but that's way more calories than I'm normally willing to consume for a drink. Starbucks emails I receive for being a Gold card holder. I did notice in the US this summer that my go-to drink gets a lot more sugar added (iced caramel macchiato) by way of the caramel. I now prefer the Chinese version and had to ask for less caramel back home. Funny how tastes adapt and change.